If I have a customer bring in a dimmer switch he thinks is not working, how can I use a multi-meter to test it without hooking it to a 120 volt source? This is a normal incandescent 600 watt dimmer. 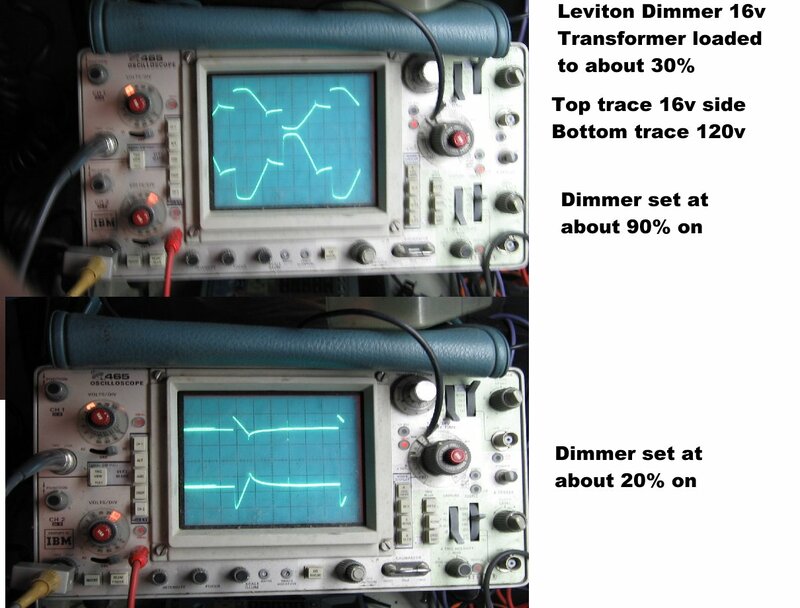 I don't think that there are many meaningful tests that you can perform on a dimmer with a multimeter. I would hook it up to a lamp and supply on the workbench and see how it behaved. You can test if it is shorted out with a DMM but that's about it. You can test some individual components if you tear it apart but hooking it up to a lamp would be the sane way to learn if it works. You can't test a triac circuit dimmer with an ohmeter. It's not a rheostat, it works by chopping the a.c waveform. I don't think a digital multimeter will give any valid results when the dimmer is powered up either, you need a scope to check the waveforms under load. Bench test it as Paul says. If it's u/s, get the customer to buy a new one. If it works ok on the bench, he's got wiring problems. The best way to test a dimmer is to swap it out with another dimmer. If that one works, the other one is bad. Ocilliscope but you are just better off pig tailing a light and a cord and just bench test it. The battery in an ordinary ohmmeter has insufficient voltage to overcome the breakdown voltage of the Diac (about 30V) so it won't show anything. Unless of course the Triac is shorted (usual fault), in which case the light cannot be dimmed. As others have said, a real world test jig is the best way. Bench test using a big light bulb and an rms voltmeter. You should see a smooth increase or decrease in the voltage across the bulb. If you need a more detailed measurement you need a scope. I think you are overthinking this. If the bulb lights and dims, it works. The most common problem I see with dimmer switches is that they are blown and won't pass voltage. I'll do basic "continuity" checks of suspected blown single-pole and 3-way electronic dimmer switches, like a Lutron Ariadne, between screw terminals, with a Fluke 87 meter, which has 40-MegOhm impedance. This doesn't really tell you much of anything other than that the switch function of the dimmer is working, or if the dimmer is not allowing voltage through. If the dimmer switch is in the OFF position or blown, the display will always read "OL". If it's in the ON position the display will bounce unsteadily at around 23 Ohms between terminals. I'm only guessing that the display bounce has something to do with the Triac firing due to the DC voltage, but I don't do this test any longer than necessary.